An exhibition from a private collection, boasting over one hundred catalogue items. 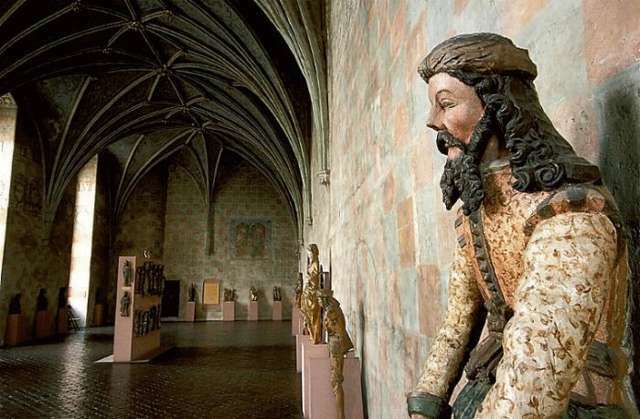 The exhibition presents sculptures, paintings and selected examples of artistic handicraft (furniture-making, goldsmithery, metalwork) created from mid-14th century to the 1st quarter of the 16th century, originating primarily from the areas of Warmia, Sambia and Upper Prussia. Lidzbark Castle, with its interior and gallery, gives the exhibited pieces a dream setting. Represented the fullest is the altar sculpture (unfortunately no complete retables) illustrating the subsequent major style phases, from the activity of the Prussian workshop, Madonnas on Lions, (i.a. good quality figures and bas-relief altar quarters from Pietrzwałd near Ostróda, ca. 1380), through International Gothic (single figures of Gdańsk provenance from the years ca. 1420–1440), ending on Realism (this group includes outstanding works of Elbląg workshops of Franconian genesis, i.a. the set of the Virgin and Child with St. Anne, and the figure of St. Andrew from the workshop of St. Wolfgang in Toruń, ca. 1504). An ornament of the collection presented in Lidzbark is the brass tombstone of Warmian Bishop Paweł Legendorf (d. 1467) funded by Łukasz Watzenrode in 1494, and probably executed by the Gdańsk workshop according to the design by Hans Brandt. A separate note is deserved by two outstanding works of Late Gothic panel painting. The wings of the polyptych from Bartoszyce, by an unknown painter from Königsberg, who made extensive use of graphical patterns, contain selected scenes from the Passion cycle. Among presentations from legends of various saints – the scene with St. Bernard of Clairvaux, known as the Miracle with the Crucifix. The large, double-side painted wings of the polyptych of St. Judoc from Sątopy in Warmia, of Franconian-Silesian artistic provenance, show the most important passion scenes and four presentations from the legend about the patron of the parish and town.